World House Galleries, New York. Anon. sale, Sotheby's New York, 11 November 1988, Lot 62A. Acquired at the above sale by the father of the present owners. L. Vitali, Morandi, catalogo generale, vol. II, Milan 1977, no. 1023 (illustrated). New York, World House Galleries, Giorgio Morandi, December 1960-January 1961, no. 36. 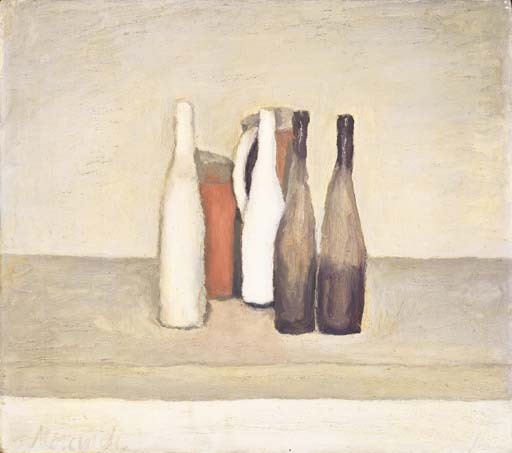 Natura morta is one of twelve paintings on a theme that Morandi painted in the spring of 1957. Depicting a small group of tall bottles and jugs settled on a shelf, its format is geometric and extremely simple. Yet within this highly restrictive format Morandi manages to reveal the subtle and complex relationships that exist in the spatial, tonal and colour arrangement of these elements. As Giorgio de Chirico once observed, Morandi "looks at a cluster of objects on a table with the same emotion stirring in his heart as the wanderer in ancient Greece felt as he gazed at groves, dales and hills, believed to be the abode of ravishing and astounding deities. He gazes with the eye of a believer, and the innermost bones of these things, dead to us because their life is stilled, appear to him in their most consoling guise; in their everlasting aspect." (quoted in foreward to, Morandi's Paintings La Fiorentina Primaverile, 1922). In the present work the whole painting is drenched in a warm Italian spring light that suggests a feathery surface to Morandi's objects at the very same time that it seems to crystallize and define them as material forms. In this exquisite painting, the objects seem somewhat squashed together at the centre of the canvas in a way that emphasises the emptiness of the space around them. The format of the painting is almost square and the objects have been arranged into a second square at the centre of the canvas. This aspect of the picture accentuates the solid, enclosed and material form of the objects and the intricate nature of the small cracks of empty space between them and their depth of field. In this way a simple, geometric and almost classical arrangement is used to elucidate the magical nature of seeing and the constantly changing nature of even the most ordinary of everyday objects. "What do all these people look for in my bottles? It is already forty years since I looked for some element of classical quiet and classical purity, a moral guidance perhaps more than an aesthetic one...It takes me weeks to make up my mind which group of bottles will go well with a particular coloured tablecloth. Then it takes me weeks of thinking about the bottles themselves, and yet often I still go wrong with the spaces. Perhaps I work too fast? Perhaps we all work too fast these days?" (Morandi in conversation with Josef Herman, reproduced in 'A visit to Morandi', exh. cat., Sydney, Art Gallery of New South Wales, Giorgio Morandi, 1997, p. 27).